Saint Irenarchos, who was from Sebastia, lived during the reign of Diocletian. In his youth he ministered to the holy Martyrs during the time of their punishment in prison. Once, on beholding seven women being tormented in behalf of Christ, and marvelling at their courage, and seeing how, although they were weak in body, they nonetheless became like men before the tyrant and put him to shame, the Saint was enlightened by divine grace and confessed Christ with boldness. Tried by fire and water, he was beheaded together with the holy women in the year 298. As a triumphant man of war enlisted with the Prince of Peace, the prince of darkness didst thou destroy utterly in thy courageous martyrdom. And now, by thine entreaties, do thou ever preserve in peace and in godliness, O Martyr Irenarchos, all them that acclaim thy valiant deeds. 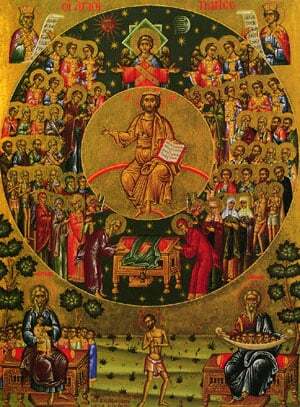 Share the feast of Irenarchos & his Companion Martyrs at Sebaste with an icon greeting ecard.